Whether you are an experienced poultry breeder or relatively new to the hobby, there are some common factors which have to be learnt in order to improve your stock. The principle factor in breeding is the ‘art of selection.’ This basically means acquiring the knowledge to understand what is and what isn’t desirable when assessing the stock you will keep, and what will be moved on to the less ‘picky’ among us. For example, garden poultry keepers are more than happy to pay a little less (or quite considerably less) for a reasonable example of a breed but which is not quite good enough for the show pen. The best way to learn just what constitutes a good example of your chosen breed is to visit shows, talk to breeders and learn about type. Investing in a copy of the relevant poultry standards is a wise thing to do, because it will enable you to learn not only what features are desirable in your breed, but just as important, which characteristics are not. Young Silver Sebright Pullets bred by Brian Sinker. A common misconception for many newcomers is that a particular breeding trio will replicate itself almost perfectly in the offspring it produces. Whilst this is a nice thought, it is very rarely the case and after years of personal experience and hours of discussion with breeders, it seems as though ‘selection’ and the art of it is the key to not only maintaining the quality of your stock, but perhaps more importantly, improving it. 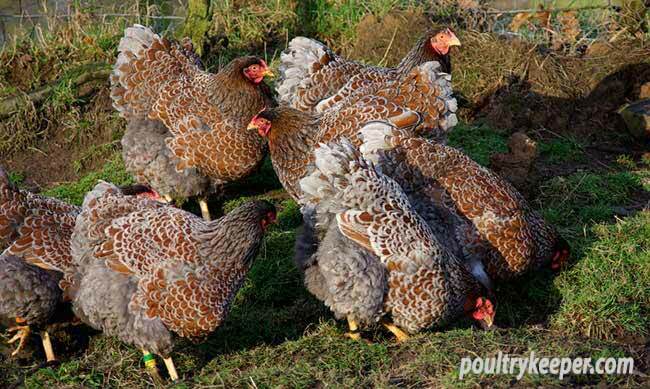 Poultry breeds remain the way they do because of a few very skilled breeders who are dedicated to the cause. For them, it’s a passion and some breeders have spent their whole lives maintaining certain strains, and in turn have been awarded the red cards and silverware at shows throughout the country. Young Blue Laced (Blue Laced Red in the U.S.) Wyandotte Females bred by Steve Dace. Breeds can soon lose their signature attributes if no thought is given to the breed standard. 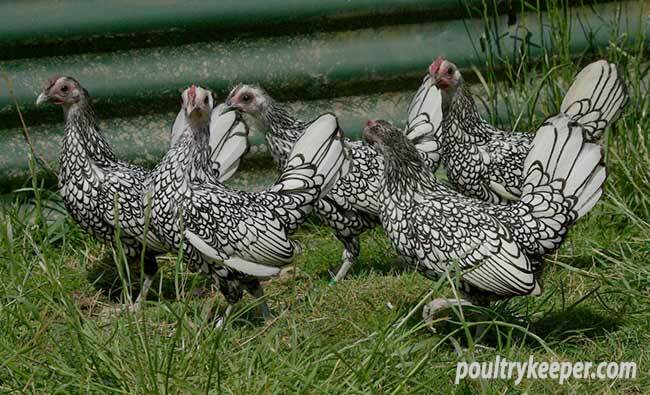 To give an example, the rare Large Blue Laced Wyandottes had so much emphasis placed on markings, that almost no consideration had been given to type and back in 2001, the few remaining examples were almost ‘Leghorn shape’ in the UK. It was necessary to import birds from Germany to help rectify this. The moral of this story is that almost every breed could end up this way if it weren’t for the few who keep the breeds as they are with their constant selection for the desirable features. I could never really understand the concept of breeding in numbers, which basically means hatching more than just 4 or 5 chicks, that was, until I realised that hatching such a small number of livestock would likely yield nothing of satisfactory value, and in order to stand a chance of producing something as good, if not better than the parent stock, then I would have to seriously consider hatching at least 30 to 40 chicks from each breeding pen. The longer you breed poultry, and especially if you show, the more particular you become about trying to breed the ‘perfect bird.’ Though it doesn’t exist, because no specimen is infallible, it doesn’t stop breeders aiming as high as possible in the hope of producing that perfect show bird one day. My personal yardstick is: if I breed 20 chicks from a fairly good breeding pen, then the chances are that 5 will be desirable for the show bench, 10 will be average and 5 will be below average. I found this ratio to be applicable to many breeds and when I use the terms ‘below average’ I refer to birds that are still a respectable representation of their breed, but would suit a garden keeper as oppose a serious exhibitor. 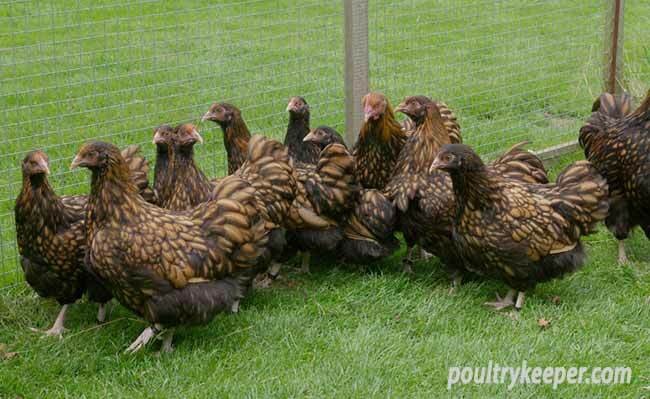 Young Gold Laced Orpington Bantams belonging to Rob Boyd. It is important to have a healthy choice from the offspring you produce. Not only do breeds share the same faults across the spectrum which are selected against by breeders, such as split wings, bent toes, wry tails, duck footedness etc, they also encounter faults which differentiate from the desired characteristics of each respective breed. To give an example, breeders of single combed breeds need to consider the amount of serrations, or ‘comb spikes’ that their stock displays, whereas rose combed breeds don’t share this concern. However, they have their own issues and depending on the breed, the way the leader (the back spike) points is a major factor when determining whether the bird in question will make the grade. The good news is that ‘like’ does produce ‘like’ and as breeders, by far our best assets are our eyes. Granted, we can’t select against the hidden faults in a line, but they do come to the surface eventually and as long as they are selected against in future breeding programs, there is less chance they will reoccur. When selecting breeding pens, major consideration should be given to gauging what each bird will produce – for example, there is no use breeding from an Orpington female if she displays 10 comb serrations, when Ideally, you are aiming for 5 or 6. That is counterintuitive unless the bird in question excels in every other way and the plan is to breed such faults out in future. Young White Silkies bred by Tinson and Hidden. Breeding is largely about having a vision in your mind of exactly what you’re aiming for – this will of course go hand in hand with the poultry book of standards relevant to each country, that is, assuming you are wishing to breed pure-bred poultry. Breeding in numbers and allowing yourself selection from the offspring your line produces can be very gratifying – especially when you encounter some superstar birds; you will feel that it’s all worthwhile.